"I've searched my conscience. I've asked the Lord to help me, but He hasn't answered." Movies about the Holocaust have often generate immense interest and controversy. This isn't surprising given that the subject matter is one of the darkest, most heinous events in the history of the world. What is surprising is how many different points of view have been used to chronicle this travesty. 2004's The Ninth Day is the product of legendary German filmmaker Volker Schlöndorff, who has helmed such films as The Tin Drum, Young Törless), and his Hollywood star-heavy productions Palmetto and The Handmaid's Tale. This is Schöndorff's film adaptation of the autobiographical novel by Father Jean Bernard, a work that sparked international controversy due to its stark portrayal of the Catholic Church and its stance on World War II and the Holocaust. The Ninth Day has received similar attention throughout the world, with many critics citing the film as Catholic propaganda. Fortunately, it is much more than that, and actually comes across as a rather neutral account of the Church's stance on the Nazi atrocities, focusing on the plight of a single priest and the crisis of faith that comes to a man of the cloth who has seen what he has seen. Father Henri Kremer (Ulrich Matthes) is a priest who is imprisoned at the Dachau in a special "priests' camp." Henri and his fellow clergymen have slightly better living conditions and privileges than the "common" detainees, but they are still barely fed and are, for example, only allowed to use a toilet for one minute a day. After watching another priest crucified and left to freeze, Henri is led out of the camp, and sent on "leave" back to his home in Luxembourg. Once he's returns to his family and begins to adjust to his old life again, Henri meets Untersturmführer Gebhardt (August Diehl), a Nazi bureaucrat who informs him that he will return to Dachau unless he can convince Bishop Joseph Philippe to side with Hitler's views. 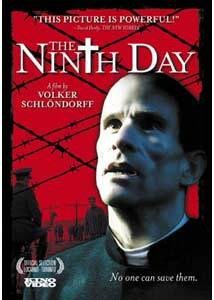 The Ninth Day is a disturbing film, but is surprisingly light on the graphic violence most Holocaust films depict. Instead, the focus is on the personal conflict that Father Kremer is enduring. One of the most poignant sequences involves Kremer telling the story of a day in Dachau when he found a rusty water pipe that was barely dripping water. The dehydrated priest had proceeded to drink as much of this water as he could, never telling his fellow inmates about this precious commodity. When he realizes the complete selfishness of this act, Kremer begins to question his belief in a God that would allow one of his direct disciples to be so heartless as to essentially allow one of his comrades to perish as a result. While this sequence is about as violent as The Ninth Day gets (aside from the crucifixion scene, which is without any close-up shots), it is just as disturbing and sad as anything in Schindler's List. The key to the success of The Ninth Day is the outstanding Oscar-worthy performance by Ulrich Matthes. Ironically, Matthes appeared in Downfall on the other side of Hitler's tyranny, more specifically, as Joseph Goebbels, while in Schlöndorff's film, he is a sympathetic figure. His Father Kremer commands our constant attention, whether from pity due to his sickly physical appearance or in rooting for him to find some way to escape the Nazi's watchful eye before the ninth day of his leave is up. Matthes' Kremer is a humble man of few words, but the actor speaks volumes via his facial expressions. The best news to come out of this viewing experience is that it's a return to form for Schlöndorff. His oeuvre is impressive, but he hasn't approached the brilliance of The Tin Drum in quite some time. Hopefully, The Ninth Day is a sign that a career renaissance of sorts is in the mix. Image Transfer Review: This 1.85:1 anamorphic widescreen presentation is a nice surprise, maintaining its gritty, grimy look throughout. Given the nature of the material, one expects dark colors that dominate, and fortunately, black and shadow levels are handled well enough. There's a slight bit of grain, but it's hard to notice it. If there are any other blemishes, they went unnoticed, resulting in what amounts to be another of this transfer's perks. Audio Transfer Review: The only audio track is a Dolby Digital 2.0 one that is much livelier than expected. This isn't an incredibly enveloping experience by any means, but there is some nice channel separation. The film is heavily reliant on its dialogue, which is always crisp and easy to understand. Extras Review: There aren't many extras, but there is a stills gallery, a collection of trailers, and a recent 16-minute interview with Volker Schlöndorff. The great director discusses quite a lot, including how the film stays mostly true to the novel on which it was based, and his experiences working with this fine cast. The Holocaust is chronicled once again in The Ninth Day, a harrowing, personal account of a priest's crisis of faith that results from his experience in Dachau. Kino on Video does this little-seen film justice, delivering above average audio and video, and a couple of extras, including an interview with director Volker Schlöndorff.